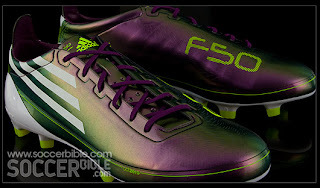 Introducing the new adidas F50 adiZero Chameleon football boots - the fastest and lightest football boot adidas have ever made. The adidas F50 adizero is the weapon of choice for players with blazing pace and lightning footwork. 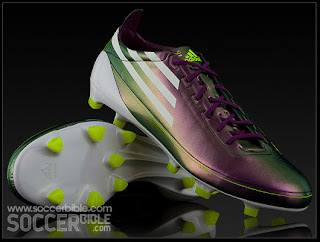 This Chameleon Purple colourway is exclusive to World Player of the Year Lionel Messi - a player who combines creativity, speed and lightning quick footwork to dazzling effect. This dazzling ability is translated to the upper, with a unique colour shifting effect that changes depending on how the light hits the upper. 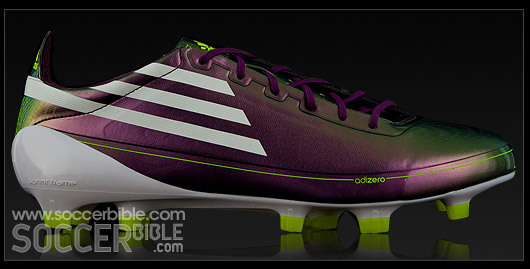 The adiZero tips the scales at a feather-light 165g (UK8), making the world's fastest players even faster! Fitting like a second skin, the new single layer synthetic SprintSkin II further reduces the weight of the boot. 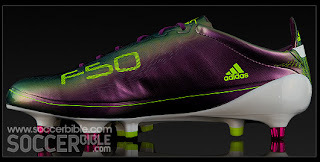 Made from a high density PU synthetic and features unique internal TPU support bands for increased support and stability. Combine this with aysmmetric parallel lacing and TPU bottom frame you have a boot re-invented, carved and honed to serve a single purpose: to be light. The Sprint Frame outsole is the lightest football out sole on the planet, and is honed with new shaped Traxion studs for maximum acceleration and faster turning. 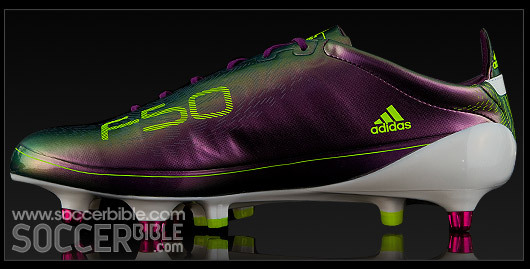 This new adidas F50 adiZero Messi features a Firm Ground (FG) sole plate, benefiting from triangular Traxion studs, highly recommended for natural firmer or drier playing surfaces.